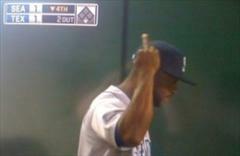 Seattle’s Milton Bradley gives the finger to Texas fans. Who’s dumb enough to believe that an asshat like Milton Bradley could or would comport himself in a manner befitting a professional athlete? Thanks for making us look stupid, Milt. President Obama appears to like George W. Bush’s odious “No Child Left Behind,” a policy which for years now has been ensuring that No Child Gets Ahead. A name change–“The Elementary And Secondary Education Act”–and a few tweaks, allow the current president to continue to revile the former chief executive while himself continuing those once-reviled policies (see also: Victory in Iraq, Obama and). One fired Rhode Island teacher was particularly displeased with Obama’s education agenda. And did this gentleman display his displeasure in a manner which would not only make his point, but do it in a gentle and poignant way, one hopefully which wouldn’t cast those opposed to Obameducation (formerly Bushedjumication) as fringey lunatics? He did not. He hanged the President in effigy. He. Hanged. The. President. In. Effigy. That’s a great way to rally people to your cause– if the people you want to attract wear tinfoil over their heads and obsess about fluoridation. Kudos to the Washington Post for not mentioning the words “racist” or “hate crime.” They’ll most likely include them in tomorrow’s edition. Check out this guy’s dickhead move: Obama effigy hung at RI school with fired teachers – washingtonpost.com.